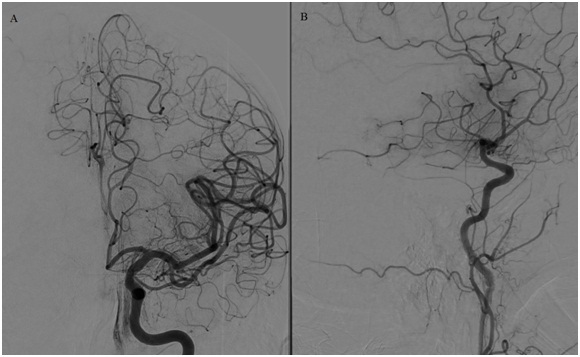 In some instances, diagnostic angiogram is performed before open surgery of head, neck, and spine to evaluate arteries of head and neck and to provide additional information on abnormalities seen on MRI or CT scan. Diagnostic angiogram is commonly performed under conscious sedation which means patient will be awake but very sleepy due to the effects of sedative medications. After administering local anesthesia, the physician will make a small incision in the groin area to gain the access of femoral artery. Subsequently he or she will place a navigating catheter in the femoral artery and advance up to blood vessels of brain and spinal cord. Contrast dye is injected into those blood vessels though another small tube and then a series of x-ray images are taken from different angles to evaluate the blood vessels of head and neck. The procedure is performed under Digital Subtraction Radiography (DSA) which means the bone is subtracted from the images to see the blood vessels. After the angiogram is completed, all tubes are removed and incision site is closed. Diagnostic angiogram is the foundation of all neuro-interventional procedures and provides a therapeutic tool for many vascular disorder of brain and spinal cord.